You ask your audience who would like to become a magician and perform their very own trick. A volunteer joins you on stage and you ask them to read out the script on the cue cards you are holding. During the routine, a second volunteer comes up on stage who freely names ANY playing card. Eventually when the last cue card comes into view an envelope is seen which contains the freely thought of playing card. Wow! Cue The Magic packs flat and plays BIG! It is great trick to get a CEO or birthday child on stage and make them the star of the show. You just sit at the side with your cue cards and they do all the performing for you. There is absolutely no force of playing card. Any card can be freely named and it will be in the envelope. Powerful stuff! Easy to do yet strong in effect. As seen on The Tonight Show with Jay Leno. 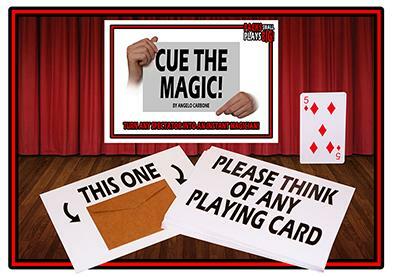 Complete with custom jumbo playing cards, carry case, interchangeable cue cards, comedy lines and four routines suitable for adults or kids. So let the magic begin... three, two, one and Cue the Magic! "Angelo Carbone is one of the most clever and creative minds in magic. 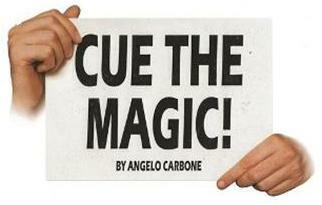 Cue the Magic is Angelo at his best and should be in the repertoire of every standup performer." "Yet again Angelo has come up with an idea that is so brilliant and combined it with a method that is devilishly simple. Just wonderful!" "Love this routine. It's as fooling as it is funny." "Stage routines as interactive and entertaining as Cue the Magic are very rare. I love performing it and you will too!" "Cue the Magic is not a trick, it's an ingenious routine."